The Robber Hotzenplotz is a merry tale of two scoundrels, two friends, a toad-fairy, and an unforgettable escapade. The Robber Hotzenplotz works hard at his job, waking early to hide in the woods and waylay new victims. One morning Kasperl’s grandmother is sitting in the sun outside her house, grinding coffee in her new musical coffee mill—a birthday gift from Kasperl and his best friend Seppel—when suddenly Hotzenplotz, attracted by the music, leaps out to steal the mill. Sergeant Dimplemoser hears Grandmother’s cries and comes to her aid, but Hotzenplotz has evaded the useless police for years. So Kasperl and Seppel vow to catch the robber themselves. 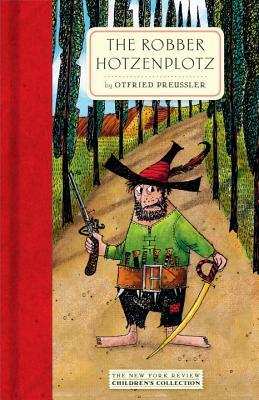 But catching robbers is not as easy as all that ... Kasperl and Seppel soon discover that even the best-laid plans can be foiled, especially when Hotzenplotz enlists the help of his wicked magician friend Petrosilius Zackleman, a gluttonous villain with a weakness for fried potatoes.